The Semifinals and Finals will both take place on June 5th. Onto the matches! This match is in the Quarterfinals of the Catch the WAVE Tournament. Mizunami won the Chrome Yellow Block, beating out Nagashima, Kizuki, and Tanaka to qualify for the next round. Chisako won her block over ASUKA, Mii, and Miyazaki so she had perhaps the easiest path to the Knockout Round. 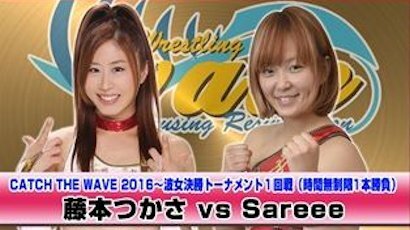 The slate is wiped clean now however, and Chisako has a much tougher opponent in former WAVE Champion Mizunami. 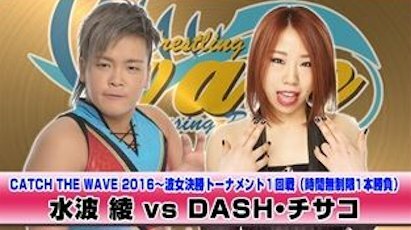 Chisako is the only Sendai Girls’ wrestler in the tournament, and it would be a notch on her belt if she can take down one of the biggest starts in WAVE. They start off politely as they trade holds, but after a moment they end up in a stalemate. Chisako knocks Mizunami to the mat and dropkicks her in the face, Mizunami falls out of the ring but Chisako gets on the top turnbuckle and dives down on top of her. Back in the ring, Chisako charges Mizunami but Mizunami throws her out to the apron and shoulderblocks her to the floor. Chisako pulls Mizunami out of the ring with her and starts hitting Mizunami with chairs, she then puts a chair on her chest and gets on the apron before hitting a footstomp. Back in the ring again Chisako works over Mizunami in the corner, focusing on the leg. Dropkick by Chisako and she hits another one in the corner, cutter by Chisako and she goes up top, but Mizunami recovers and joins her. Headbutts and elbows by Mizunami and she powerslams Chisako to the mat for a two count. Mizunami puts Chisako on her shoulders but Chisako slides off. Chisako goes off the ropes but Mizunami catches her with a powerslam, legdrop by Mizunami and she hits a German suplex. Jumping legdrop by Mizunami, and she covers Chisako for another two. Mizunami charges Chisako but Chisako hits a quick cutter before elbowing Mizunami in the corner. Northern Lights Suplex by Chisako, she goes up to the top turnbuckle and she delivers a diving footstomp for a two. German suplex by Chisako but Mizunami drops her with an uranage, she picks up Chisako and hits three more uranages, but Chisako kicks out of the pin. Lariat by Mizunami, she applies a full nelson but Chisako gets out of it. Hard elbows by Mizunami, she goes up top, but Chisako recovers and dropkicks her. Chisako snaps Mizunami’s neck on the top rope, she goes to the top turnbuckle and nails a diving footstomp. She goes for the Hormone Splash, but Mizunami gets her feet up as she dives off. Chisako and Mizunami trade elbows, Mizunami charges Chisako but Chisako applies a crucifix pin for two. Mizunami gets Chisako on her shoulders but Chisako slides off and rolls her up for another two. Chisako’s quick pins continue to not work, she goes off the ropes and Mizunami levels her with a lariat. Dragon Suplex by Mizunami, but Chisako barely gets a shoulder up in time. Lariat by Mizunami, she goes up top and she nails the diving legdrop for the three count! Mizunami wins and moves on in the tournament. This match is in the Quarterfinals of the Catch the WAVE Tournament. Yoshiko edged out Hamada and Kagetsu to win her block, in what was one of the toughest blocks in the entire tournament. Nakamori on the other hand did not have an easy block either, as she beat out both Misaki Ohata and Makoto. 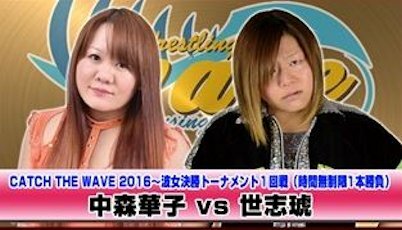 This is the first time that Nakamori and Yoshiko have ever faced off in singles action, and hopefully Yoshiko can get a good match out of the solid hand in Hanako Nakamori. They get right to it as they rapidly trade wristlocks, shoulderblock by Yoshiko but Nakamori comes back with kicks in the corner. Lariats by Yoshiko and she bootscrapes Nakamori, she goes for a running kick but Nakamori moves and Yoshiko lands out on the floor. Nakamori gets on the apron and jumps down onto Yoshiko before throwing a chair at her, but Yoshiko chokes her against the post. Back in the ring, Nakamori puts Yoshiko in a submission hold but Yoshiko gets into the ropes to force a break. Yoshiko knocks down Nakamori and puts her in a crab hold, she then puts her in a choke but Nakamori gets in the ropes. Bootscrapes by Yoshiko and she hits the running kick this time, Nakamori doesn’t move so Yoshiko blasts her with another one. Nakamori comes back with a big boot, another big boot by Nakamori and she covers Yoshiko for two. Nakamori goes for the fisherman buster but Yoshiko blocks it and hits a vertical suplex. Kicks by Nakamori but Yoshiko jumps on the second turnbuckle and dives off with a lariat. Samoan Drop by Yoshiko and she hits a pair of sentons, but Nakamori rolls out of the way of the third. Legdrop by Nakamori and she puts Yoshiko in a choke submission, but Yoshiko wiggles to the ropes to force a break. Big boot by Nakamori and she hits two more, cover by Nakamori but Yoshiko gets a shoulder up. She goes for a Shining Wizard but Yoshiko blocks it, tilt-a-whirl backbreaker by Yoshiko and she hits a running senton. Yoshiko puts Nakamori in a backbreaker before slamming her to the mat, sliding Lariat by Yoshiko but the cover gets two. Yoshiko gets on the second turnbuckle but Nakamori avoids the diving senton, headbutts by Nakamori and she hits the Shining Wizard for a two count. High kick by Nakamori but Yoshiko fires back with a lariat, fisherman buster by Nakamori but Yoshiko kicks out of the cover. Nakamori goes up top but Yoshiko avoids her when she dives off and applies a sleeper choke. Chokebomb by Yoshiko, she goes off the ropes but Nakamori hits a high kick. Head kick by Nakamori but Yoshiko blocks the suplex attempt and hits a short arm lariat. Yoshiko goes off the ropes and lariats Nakamori again, cover by Yoshiko and she gets the three count! Yoshiko moves on in the Catch the WAVE Tournament. This match is in the Quarterfinals of the Catch the WAVE Tournament. Sareee is probably the biggest surprise to reach the Quarterfinals as she was in the same block as Yumi Ohka, the winner of last year’s tournament. Fujimoto had a pretty easy path as she beat out Miyu, Cherry, and Haruhi, winning her block convincingly with three wins. Sareee is definitely the underdog here as she is far less experienced and accomplished than Fujimoto, but she has been known to surprise people with her ability to hang in with anyone. Being the plucky underdog, Sareee dropkicks Fujimoto before she can even get into the ring, she goes for a diving body press but Fujimoto moves out of the way. Dropkick by Fujimoto and she kicks Sareee in the back, she puts Sareee in a leg submission but Sareee quickly gets out of it. Dropkick by Sareee and the duo trade elbows until Sareee chops Fujimoto to the mat. Sareee attacks Fujimoto in the corner but Fujimoto puts Sareee in the ropes and hits a dropkick. Sareee bridges out of the pin and hits her own dropkick, Sareee tries to roll-up Fujimoto but Fujimoto kips up and kicks Sareee in the head. Dropkick by Fujimoto and she dropkicks Sareee again in the corner, she goes up top and hits a missile dropkick for a two count. Crossface by Fujimoto, but Sareee quickly gets into the ropes. German suplex by Sareee and she dropkicks Fujimoto while she is against the ropes, she goes up top and she hits a missile dropkick for two. Fujimoto blocks the next German suplex attempt but Sareee applies a couple quick pins. Fujimoto rolls through one and hits a PK before putting Sareee in a cross-arm suplex. Fujimoto goes up top and hits a diving neckbreaker, covering Sareee for two. Fujimoto gets Sareee on her shoulders but Sareee slides off and rolls up the veteran for two. German suplex hold by Sareee, but Fujimoto kicks out. Fujimoto blocks the uranage, elbows by Sareee and she hits a running bodyscissors roll-up for two. Uranage by Sareee, she covers Fujimoto but Fujimoto gets a shoulder up. Fujimoto blocks the next attempt but Sareee blocks the Yoshi Tonic. Fujimoto gets Sareee up on her shoulders and she nails the Japanese Ocean Cyclone Suplex Hold for the three count! Fujimoto wins the match and moves on in the tournament. This match is in the Quarterfinals of the Catch the WAVE Tournament. Iida got into the Quarterfinals by dubious means as far as I am concerned, as she won a three-way tie-breaker match by Countout (the match hasn’t been released so I don’t know how she pulled that off). Yamashita’s method to get to the Quarterfinals was much more impressive, as she defeated Hikaru Shida and Kaho Kobayashi which is no easy feat. Yamashita is affiliated with Daijo Pro but is a regular in WAVE, and has the least experience of any wrestler in the Quarterfinals. I predict lots of lariats! After the introductory exchanging of holds, Yamashita hits a hard shoulderblock which sends Iida flying to the mat. Yamashita throws Iida in the corner and hits a series of chops, but Iida puts her in short armbar. Yamashita gets into the ropes to force a break, Iida keeps working on the arm before re-applying an armbar. Knees by Iida and she hits an armbreaker, but Yamashita slides behind her and applies a sleeper. Iida quickly gets out of it and goes back to Yamashita’s arm, but Yamashita picks her up and hits a bodyslam. Iida manages to slap on the cross armbreaker, but Yamashita gets a boot on the bottom rope. Yamashita slams Iida in the corner but Iida avoids her charge and snaps her arm over the top rope. Iida goes up top but Yamashita lariats her, sending Iida crashing out of the ring. Yamashita goes out after her and goes for a lariat, but Iida ducks and Yamashita lariats the ring post. Back in the ring, Iida goes up top and she delivers a missile dropkick for two. Rolling Fisherman Suplexes by Iida, she uppercuts Yamashita but Yamashita avoids the dropkick. Lariat by Yamashita in the corner and she hits a backdrop suplex, but Iida gets back in control and goes back to the arm. Dropkick by Iida while Yamashita is against the ropes and she hits a second one, followed by a third. Iida goes off the ropes but this time Yamashita catches her with a lariat. They both slowly get up and trade strikes, lariats by Yamashita, kick to the chest by Yamashita and she covers Iida for two. Yamashita gets on the second turnbuckle and hits a diving elbow drop, getting another two count. Yamashita goes off the ropes, Iida avoids her charge but Yamashita hits a backdrop suplex anyway. Sleeper by Yamashita but Iida rolls out of it and applies a quick pin for two. Iida goes off the ropes but Yamashita hits a quick lariat, she goes for another one but Iida avoids it. Sliding Lariat by Yamashita, but Iida barely gets a shoulder up on the cover. Another lariat by Yamashita, and this time she picks up the three count! Rina Yamashita is your winner and moves on in Catch the WAVE. I really enjoyed all four of these matches, there was not a bad one in the bunch. The Yoshiko match was dragged down by Nakamori but was still fun, and all the rest of the matches were entertaining. The matches were clipped only very slightly, it wasn’t noticeable, so I can’t knock WAVE for that like I usually do. I wouldn’t have minded seeing the full card but still this is a lot of quality matches on one show. Definitely worth watching if you have the Wave Network.